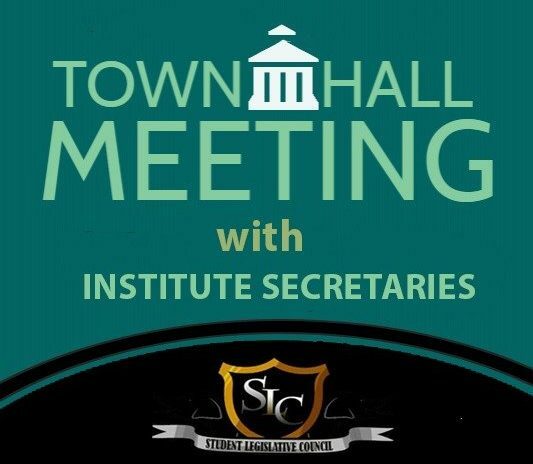 The Town Hall convened on January 30 saw the addressing of issues that are in the limelight for various reasons, primarily those concerning research scholars and guides, hostel elections, accommodation and quality of general facilities. The panel addressing the issues consisted of the SLC Speaker, the Executive Wing and the Spokesperson of the Students Election Commission. The meeting had a delayed start due to low attendance and after a 15 minute delay the floor was opened to questions from the General Student Body. The session was initiated with a question to the Research Affairs Secretary, Ashok Kumar, regarding workplace issues faced by the research scholars. The problems faced by research scholars were attributed to workplace issues, particularly regarding air conditioners, with a rule stating that the ACs must be operated only in places with heavy machinery. This was clarified by an Executive Wing member who stated that infrastructural changes were being made to address the issue. As a short term solution, a 24×7 reading hall in the basement of the Central Library was proposed by the Students’ General Secretary, Sai Kiran. Following up on the recently published notification about the postponement of hostel elections, the Executive Wing was queried if it was approached for any recommendations regarding such a shift, the implications it might have on LitSoc and TechSoc, and the ethicality of making such a decision when two seats on the Student Election Commission are still unfilled. The Executive Wing members clarified that with the fresher undergraduate batch moving out a year ago in the hostels of Bhadra, Cauvery and Krishna, an election was thus pointless for those hostels, as a result of which a special recession was given to these 7 hostels to appoint their representatives. However, they stated, this was an exceptional case and was not expected to occur again. The question led to a heated back and forth deliberation between GSB, Executive Wing and Student Election Commission. It was mentioned that the rest of the Executive Wing was informed only a week before the notification with the IAR Secretary, Vineesha B and AAS, Sashi Sekhar not being informed at all. The Cultural Secretaries, Sri Krishna and Srikanth commented that the decision by itself would practically not affect Lit-Soc to an alarming degree. This was followed by the Student Election Commission providing an extended explanation as to why the hostel election was postponed; it was communicated to the GSB that since a hostel allotment list regarding the information available on composition of the hostels was not compiled yet due to general constraints, it was impossible to allow nominations for the candidates, since they would not know their electorate; and to add to the point, with the practice of students verifying the validity of nominations, especially the correctness of the grade card, a proposal was put forward for taking the responsibility from students. It was informed the validation would take an additional week to be completed,as a result of the issues stated and such a proposal had therefore been put forward. A discussion, primarily concerning the point of why the SLC as a whole was not intimated with only a few legislators being notified, was held. The Student Election Commission replied that even though the students on a whole were not intimated the SLC Speaker, Nikhil N was informed with him being the representative of the people. This led to a debate on whether or not the Speaker can be taken as the’ representative of the entire student body and the discussion was closed with the question of whether the policy decision by itself was completely democratic. When further questioned about the validity of shifting the elections, the Student Election Commission clarified that the Dean, Administration and the Election Officers were made aware of this issue only at the start of the semester; and since the hostel allocation lists have not been made regarding the freshies and PGs as such, the proposal to shift the elections was made. Upon being asked by a member of the GSB, the Academic Affairs Secretary and the International & Alumni Relations Secretary informed the GSB, that they were not notified. The Student Election Commission spokesperson further clarified that he had not taken the AAS and additionally the RAS, Ashok Kumar for their opinion as he thought departments were not going to be involved in the issue. A GSB member further commented that the decision to shift the hostel elections, which was made solely by the Student Election Commission without proper debate, was a good policy decision, albeit non-democratic. The Student Election Commission clarified that the opinions of the major student representatives, namely the SGS, Speaker and the legislators were taken into account. The matter was put off for discussion later, with the GSB member stating that the opinion of the SLC as a whole being taken into account was pivotal in such a policy change, and not just those of the major student representatives. Discussion on methods to resolve NSO grades was raised by a GSB member which was answered by the Sports Secretary, Dhyaneshwaran who expressed the opinion that a mail being routed through the Secretary himself would speed up the process. An issue regarding Wi-Fi connectivity during placement and the security of placement portal was brought to the discussion.The Academic Affairs Secretary, clarified that the Wi-Fi bandwidth capacity will be increased by shifting the placement location to Raman-Ramanujan block next year. He also clarified that the creation of a new portal, being constrained by budget, will happen over the span of a few years with a hike in the placement fee, while maintenance was done to keep the portal functional. It was made known to the GSB, that the placement test conducted by the team was funded jointly by the Gymkhana and the students. Further questions were put forward regarding alumni membership form and room allotment during Inter-IIT and Shaastra-Saarang. Most of the room allotment issues, the Executive Wing opined, can be attributed to an infrastructure crunch which posed a major problem this year and might not happen in the year to come when necessary communications will also be made efficiently to reduce the issues caused by this. A feedback system, similar to the Teacher Course Feedback system, was asked by the research scholars to be put into effect for guides. One of the major hurdles for such a system was that no proper method of evaluation could be finalized for such a system and ensuring anonymity in such a method would pose a problem thus rendering it arbitrary. The Research Affairs Secretary was also asked for the formation of a Grievance Committee, to which Research Affairs Secretary and the Academic Affairs Secretary responded collectively with the RAS mentioning an initiative with 7 agenda points which is due for approval and which will eliminate most of the issues faced currently. The process of room sharing by Research Scholars was deliberate on the grounds of its accountability being ambiguous. A point raised was that the accountability for a delayed project has to be shared since there could exist an equal likelihood of the guide being responsible for the delay. The Academic Affairs Secretary addressed the issue by pointing out that such an evaluation has to be done on a case-to-case basis and not on a whole and the formation of a Grievance Committee will dramatically increase the pace of such evaluation. A question was posed to the Speaker regarding the amends in Student Constitution and progress made, to which the Speaker replied that a document has been compiled and sent to the Dean with minor corrections left to be made. Upon being questioned about the implementation of food trucks and packaged breakfast, the Hostel Affairs Secretary informed that the food truck will not be made possible due to NGT constraints and the packaged breakfast along with optional dining will be made possible starting next month. A discussion was started regarding the HDC (Hostel Disciplinary Committee) with the opinion that rooms visited by female students are targeted for raids. The Students’ General Secretary replied to the question stating that it happens to be a routine to check the register at the security desk and restrict illegal stay and all the raids may not be targeted towards such rooms. Concerns were raised regarding the monetary penalisation mechanisms conducted during raids with a case being cited. However it was remarked by the SGS that the issue was specific to the case mentioned and is not the same across all the raids. GSB members commented on the rules to be followed by HDC and raised concern for the need of a rulebook for the same. Answering the question of PG participation, Sports Secretary clarified that initiatives have been taken from his end and the same is underway citing examples of several mentorship programs with considerable registrations. Discussions regarding the placement opportunities for PhD and research scholars was addressed by the Research Affairs Secretary, who pointed out the substantial increase shown in placement statistics. Upon being asked about the opportunities in PG section being lower compared to UG, the AAS stated that everything is being done from his end to increase the opportunities, but it being a two way street, responding to the opportunities is the sole way to make the most out of them. It was informed by the SLC Speaker at 9:45 pm that the meeting would close in five minutes due to time constraints. The meeting had lasted for a little over one and a half hour, with the participation being low relative to other institute events. Even though part of the discussion regarding the shifting of hostel elections was cut short, the session was closed without further questions owing to an Executive Wing meeting at 10 pm the same day. Note: Featured image is taken from the SLC poster.